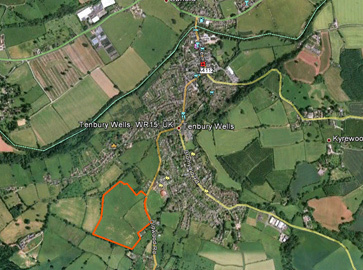 Kensington & Edinburgh Estates Ltd, one of the property development companies within The Pickstock Group, has secured planning consent for a residential development of 44 units in the attractive market town of Tenbury Wells in Worcestershire. This consent was won at appeal following the refusal of the original outline application in April of this year. Kensington and Edinburgh Estates is currently considering its strategy based around the evolving local plan. The 44 residential units will be built over approximately 9.5 acres and is situated in a desired rural location on the southern edge of the town. Whilst surrounded by open countryside the site is well located with services and amenities accommodated by Tenbury Wells. 18 of the dwellings will be affordable housing, 13 being social rented units and 5 shared ownerships under the Help to Buy scheme. The S106 agreement in place with this development includes contribution to a bus map, bus stop, drop kerb, open space and pedestrian and cycleway improvements.